Ready to Wear Clergy Robes & Cassocks for men and women: pulpit robes, pastor robes, preaching robes, minister gowns from The Robe Shop, made in USA. If you need a basic robe, you will probably find it here, as this page features styles with the most range of sizes. Ministry couples or clergy teams who want to coordinate their apparel will find good ideas here as well! Each style limited to this page is either 1 garment that has sizes for both men and women, or a garment that has matching style elements with another. Far more individual styles can be found on our separate men's or women's clergy garment pages- please see the links below, or use the navigation tool at left. The page is best viewed by scrolling, in order to see the coordinating styles. Click option is below. Liturgical vestments: surplice, rochet, tippet, chausuble, etc. The styles on this page are part of our "Qwick-Ship" collection of ready-made tailored apparel. 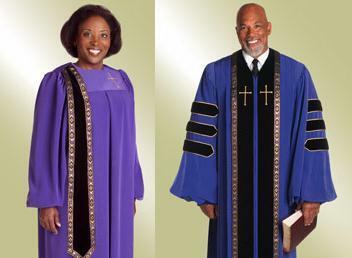 These are for purchase only- rental clergy robes are totally different inventory (see link above). Listed prices apply to the Qwick-Ship items pre-made in standard sizes, with NO variation. Sorry, we cannot add monograms or provide other fabrics and colors for Qwick-Ship robes. Robe ordering FAQ answers most questions, from sizing to order forms, and explains the difference between custom and "Qwick-ship" garments. Item #GNH-114 $398.90 The John Wesley Black Doctoral Robe for Men. Coordinated style for men (RT WEsley H-158 or H-205)- get a matching husband/wife set! Sizing for men AND women- get a matching husband/wife set! Our heavy duty wooden contoured Robe Hanger is designed to preserve the yoke shape between wearings. Over time, a wire hanger can rust and cause crease lines on the shoulder of your choir or pulpit robe. Item #GN10155 $89.90 Carryall Garment Bag: Ideal for both travel and storage, our deluxe carryall bag has been designed especially for longer items.